21st May 2013, 6-8pm, RMIT Design Hub – corner of Victoria St & Swanston St.
DESIS-lab Melbourne has the great pleasure to host a panel discussion to coincide with Dominic Campbell’s visit to Melbourne on the 21st May 2013. 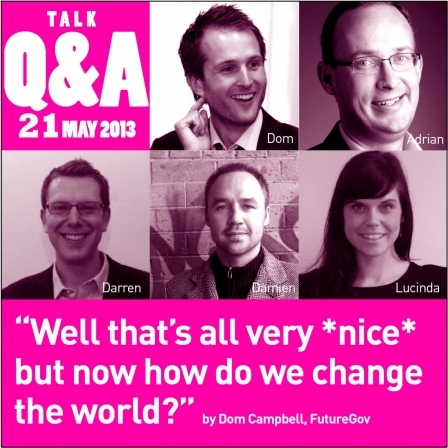 Dom is the Director of Futuregov, UK, leading the way on using digital technology to improve the public services. This article in The Guardian gives a good snapshot of their recent work. Damien Melotte, partner in System Reload. System Reload is a Strategic Design consultancy that is passionate about building thriving organisations that can adapt to disruptive change in the relationships age. Their approach is a combination of Service Design, Customer Experience, Digital and Social Business. Damien has worked with a range of public, private and Non Government Organisations in project design, social innovation, trends analysis, customer experience, strategic design, business strategy development, tactical tool development and workshop facilitation. Damien supports organisations to distil complexity through visualising and unravelling problems and working through a collaborative process to develop solutions. The panel discussion will be moderated by Yoko Akama, leader of DESIS-Lab Melbourne, Service Design Network Melbourne and Acting Research Leader of Design Research Institute, RMIT University. This forum is nested within a broader program of the Design Research Institute Convergence Exhibition, open from 2nd – 24th May 2013 at RMIT Design Hub. This event will be filmed and archived on the DESIS-lab Melbourne resource website.